When the construction of Norman Jackson Children's Centre in London started, the local council commissioned artists to design a sensory garden full of wonderful sights and sounds so the 3 to 5 year old children using the centre could have fun playing there. Sand pit, water feature, metal tree and willow pods all seemed pretty easy to install and wouldn't take much looking after, but what about sound? How do you bring interesting sound to an outdoor space and make it fun for young children? Nela Brown from Queen Mary's Interactive Media and Communication group was given the job. After thinking about the problem for a while she came up with an idea for an interactive sound installation. She wanted to entertain any children visiting the centre, but she especially wanted it to benefit children with poor language skills. She wanted it to be informal but have educational and social value even though it was outside. You name it, they press it! Somewhere around the age of 18 months, children become fascinated with pressing buttons. Toys, TV remotes, light switches, phones, you name it they want to press it. Given the chance to press all the buttons at the same time in quick succession, that is exactly what young children will do. They will also get bored pretty quickly and move on to something else if their toy just makes lots of noise with little variety or interest. Nela had to use her experience and understanding of the way children play and learn to work out a suitable 'user interface' for the installation. That is she had to design how the children would interact with it and be able to experience the effects. The user interface had to look interesting enough to get the attention of the children playing in the garden in the first place. It also obviously had to be easy to use. Nela watched children playing as part of her preparation to design the installation both to get ideas and get a feel for how they learn and play. She decided to use a panel with buttons that triggered sounds built into a seat. One important way to make any gadget easier to use is for it to give 'real-time feedback'. That is, it should do something like play sound or change colour as soon as you press any button, so you know immediately that the button press did do something. To achieve this and make them even more interesting her buttons would both change colour and play sound when they were pressed. She also decided the panel would need to be programmed so children wouldn't do what they usually do: press all of the buttons at once, get bored and walk away. Ideally, children shouldn't just press all the buttons at once, get bored and walk away. Nela recorded traditional stories, poems and nursery rhymes with parents and children from the local area, and composed music to fit around the stories. She also researched different online sound libraries to find interesting sound effects and soundscapes. Of the three buttons, one played the soundscapes, another played the sound effects and the last played a mixture of stories, poems and nursery rhymes. Nela hoped the variety would make it all more interesting for the children so keep their attention longer and by including stories and nursery rhymes she would be helping with language skills. Coming up with the ideas was only part of the problem. It then had to be built. It had to be weatherproof, vandal-proof and allow easy access to any parts that might need replacing. 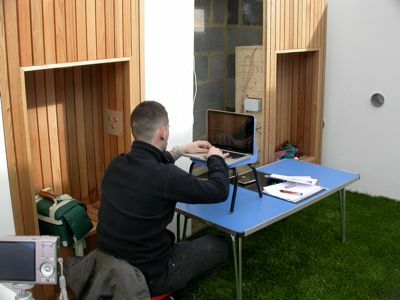 As the installation had to avoid disturbing people in the rest of the garden, furniture designer Joe Mellows made two enclosed seats out of cedar wood cladding each big enough for two children, which could house the installation and keep the sound where only the children playing with it would hear it. A speaker was built into the ceiling and two control panels made of aluminium were built into the side. The bottom panel had a special sensor, which could 'sense' when a child was sitting in (or standing on) the seat. It was an ultrasonic range finder - a bit like bat-senses using echoes from high frequency sounds humans can't hear to work out where objects are. The sensor had to be covered with stainless steel mesh, so the children couldn't poke their fingers through it and injure themselves or break the sensor. The top panel had three buttons that changed colour and played sound files when pressed. Interaction designer Gabriel Scapusio did the wiring and the programming. Data from the sensors and buttons was sent via a cable, along with speaker cables, through a pipe underground to a computer and amplifier housed in the Children's Centre. The computer controlling the music and colour changes was programmed using a special interactive visual programming environment for music, audio, and media called Max/MSP that has been in use for years by a wide range of people: performers, composers, artists, scientists, teachers, and students. The panels in each seat were connected to an open-source electronics prototyping platform by Arduino. It's intended for artists, designers, hobbyists, and anyone interested in creating interactive objects or environments, so is based on flexible, easy-to-use hardware and software. The next job was to make sure it really did work as planned. The volume from the speakers was tested and adjusted according to the approximate head position of young children so it was audible enough for comfortable listening without interfering with the children playing in the rest of the garden. Finally it was crunch time. Would the children actually like it and play with it? The sensory garden is making a difference - the children are having lots of fun playing in it and within a few days of the opening one boy with poor language skills was not just seen playing with the installation but listening to lots of stories he wouldn't otherwise have heard. Nela's installation has lots of potential to help children like this by provoking and then rewarding their curiosity with something interesting that also has a useful purpose. It is a great example of how, by combining creative and technical skills, projects like these can really make a difference to a child's life.